The AMD FirePro W4100 is a professional graphics card for mid-range workstation PCs. It is based on the Cape Verde chip (GCN 1.0), that can also be found in mobile consumer cards like the Radeon R9 M370X. 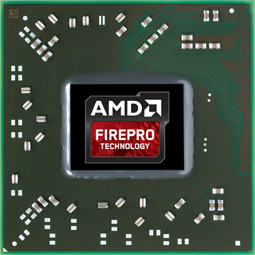 The chip integrates 640 shader cores, but the FirePro W4100 only offers 512 that are clocked at up to 630 MHz. Furthermore, the graphics card includes 2 GB GDDR5 memory clocked at 1000 MHz (4000 effective) using a 128 Bit memory interface (64 GB/s). The card is intended for professional applications like CAD or 3D construction and offers certified drivers. Compared to mobile FirePro graphics cards, the W4100 is very similar to the W4170M. In 3D games, the performance is similar to a Nvidia GeForce 940M. The 512 shader cores can also be used by OpenCL for computational tasks (as 8 compute units). The power consumption is rated at 50 Watt (TDP) and therefore quite low for desktop graphics cards.